PINK! For whatever reason, the wine world screams pink when summer comes along, and suddenly the LCBO is awash in a tidal wave of blush. 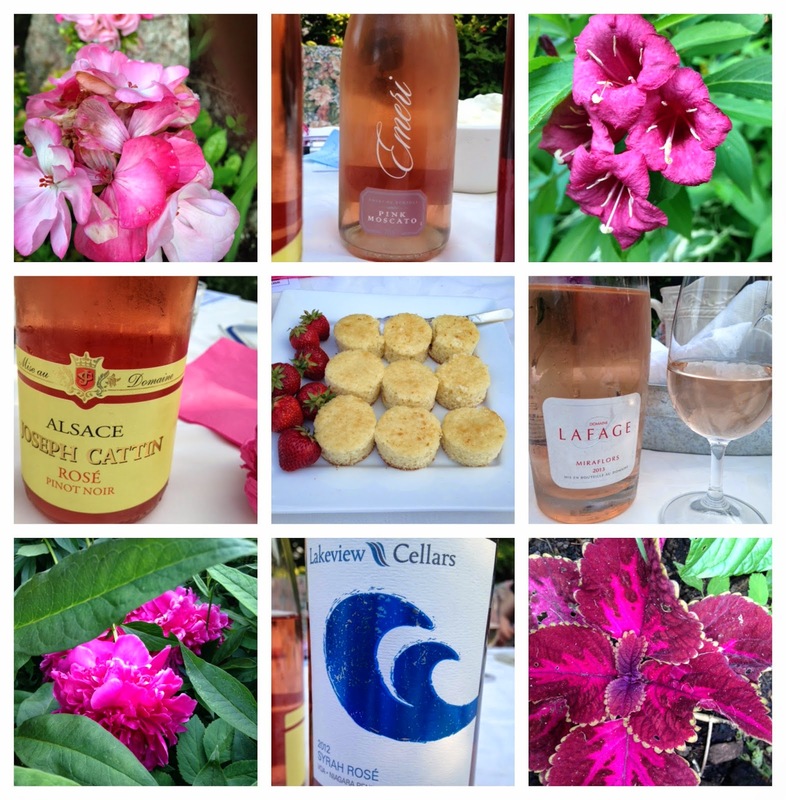 While I try not to limit rosés to the warm months (since there are so few of them in this Canadian climate) I gladly accepted an invitation to Jane's Place for a tasting of all things pink. Jane, the lesser-known sister of Martha Stewart, doilied up her lush back garden (replete with rosy blooms a-plenty) with an elegant table and decadent spread for our little group of four, which included Holly and Eva. Accompanied by a subdued chorus of birds and bees, and beneath the paling light of a golden sunset, we indulged. Lafage 2013 Miraflors (Côtes du Roussillon, France) - Pale, brilliant peach tones hint at the light, airy feel of this mourvèdre-grenache gris blend. Delicate notes of sun-dried linens, rosewater and chamomile give way to an almost citrus-y flavour profile and crisp finish. Joseph Cattin 2013 Pinot Noir Rosé (Alsace, France) - Holly spent a dreamy 10 days in this famed wine region recently, lucky her, so an Alsatian rosé was brought out. Pinkish-orange with a watery rim, it had a distinct herbal scent to it, with a whiff of just-extinguished sparkler (suggesting the presence of sulfur, but not in a nasty way.) Tangy on the palate, dry-style, mere hint of cranberries. Lakeview 2012 Syrah Rosé (Niagara, Ontario) - Previously reviewed, I thought this extra bottle from Diamond Estates would be appreciated by my fellow tasters. Deep pink bordering on red, a matching nose of lilac, strawberry jam and bubblegum. Another one done dry, the texture is smooth, with muted acidity and a whisper of tannins. It has a pronounced juicy berry flavour without being sweet at all. Emeri de Bortoli Pink Moscato (Australia) - Orange-kissed pale roseate hue reminiscent of spring petals, with plentiful mousse, a flinty nose and candy floss on the palate. Excellent with Jane's mini strawberry shortcakes and homemade whipped cream.